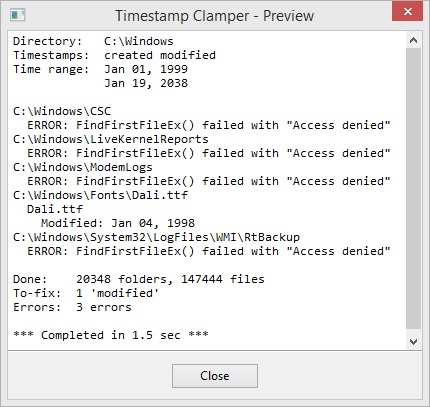 Timestamp Clamper allows resetting file and folder timestamps that fall outside of specified time range. In particular, it can be used to reset timestamps that are so far in the past (or in the future) that they are not supported by the file system of the backup device. As a result these timestamps cannot be correctly replicated from source to the backup and this will cause source and backup copies to _appear_ to be out of sync as they timestamps won't match. This in turn will cause Bvckup 2 to needlessly re-copy these files on the next run. 3. Specify target time range. 4.a Press Preview to do a simulated run. 4.b Press Process to do it for real. Timestamps that are earlier/later than the range start/end time will be replaced by the latter. Timestamps on both files and folders are checked. Preview is exactly the same as Process, except it skips issuing "set timestamps" requests when out-of-range timestamps are found. The log shows files/folders that have out-of-range timestamps and any errors encountered when scanning or setting new timestamps. No installation required - download and run. Just curious, which filesystems have issues with timestamps? It's not that they have issues with _timestamps_ per se. It's that different file systems have different timestamp _ranges_ that they support. NTFS times can go as far back as 1600-01-01, but the FAT family only supports 1980-01-01 and onward. Meaning that there are NTFS timestamps that cannot be cloned onto a FAT-based storage. Thank you, that is what I needed! For whatever reason, I have some images (24 files), that have such dates: 1971, 1973 and cannot be changed... and Bvckup says, this is an error. I get SetFileTime() failder with 87. 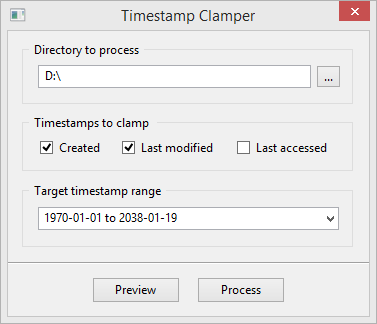 Which programming language was used to create Timestamp Clamper? C++ ... though rather light on the ++ features, so it's more of C with classes, some inheritance and a bit of templates. Having used Bvckup for years I am now coming across problems. I am getting 'Error: access denied' When I check the error I see 'SetFileTime' no numbers included. I have tried the above fix to no avail. When run it shows no errors or fixes. Any ideas? 1. What are your source and destination devices?